Songwriting Tip: Creating Cool, Daily Content for Your Fans. Easily. Creating Cool, Daily Content for Your Fans. Easily. So you’re an emerging artist. That means by now, you probably feel like you’ve seen about a million articles from industry reps talking about how important it is for you have daily interaction with your fans. You need to be on Facebook getting “Likes,” Youtube getting hits, tweeting until your hands are raw, etc. etc. You get it. But unless your last name is Gaga, your life probably isn’t that fascinating on a daily basis. So the question is, how can you create content that’s actually cool and interesting to your fans on a daily basis? Well, I’m here to try and help answer that. Here are a couple ideas and tools to capture your daily activities and make them look pretty nifty too. Added bonus: these apps and tools all allow you to immediately share via Twitter, Facebook and more. Take “Vintage” Digital Photos. Typing “Making my morning coffee” on Twitter doesn’t sound that rad… when you say it like that. But using a photo is a fun and easy way to share something simple from your day. To make it even more exciting, there are a few fun “vintage photo” apps out there to make your morning coffee even look cool. See my super-awesome examples below. Voilà! 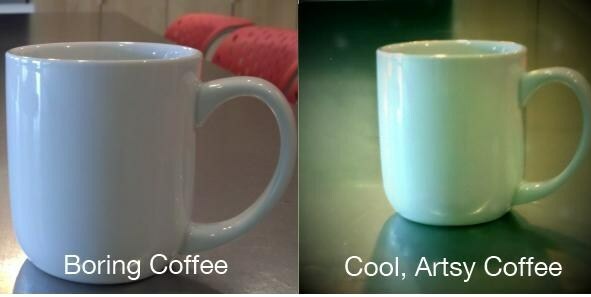 An ordinary coffee cup is turned into a photo that could qualify for the wall of your local Starbucks (ok, that might be stretching it, but you get the idea). If you’re a Droid user, my favorite app is Retro Cam. iPhone users should check out Instagram. Mix Daily Video Clips with your Tunes. You’ve seen it a million times: A person sitting in front of their computer, the backdrop is a bedroom or basement, and it’s just another talking head. This is fine every once and a while to give several updates at once (a nice alternative to a newsletter) but it’s easy to expose daily activities in a more creative way. Check these out: Taking a ski trip? Pidgeon eat your lunch? Or maybe you’re really happy about a Snow Day? Putting together a few clips taken with your data phone and using some of your music as a soundtrack can be a clever way to showcase a new demo or bring back an old tune you released a few years ago. Apps with cool video effects: 8MM Vintage Camera app for iPhone and Videocam Illusion for Android. Edit clips together on your phone with apps like Reel Director or Qik. Make Gig or Studio Photos into a Mini Production. Sonicbids Product Manager (and pal) Lou gave me this idea and I’m a fan. Once you’ve taken all of your cool content in the ways listed above, use it to create a quick and easy mini production. Play a gig last night? This is a great way to showcase your favorite photos from the evening in a snappier way than your average Facebook photo gallery. Animoto, lets you create quick 30 second productions (which you can throw together in minutes) for free and seems to hit it out of the park. But you can also check out Masher, too. So there you have it. A few ideas to make that experience waiting in line at Guitar Center staving off the headache from the florescent lighting an opportunity to engage your fans. Don’t forget to show me a photo (@SonicbidsTess) when you do. This article is written by Tess Cychosz from Sonicbids. High fidelity audio is key. Long gone are the days where a cheaply recorded demo is fine to shop to promoters and music buyers. With high-quality studio equipment becoming more and more accessible and home studios beefing up, it’s hard to ask any music professional to ignore the fidelity of your recording anymore. 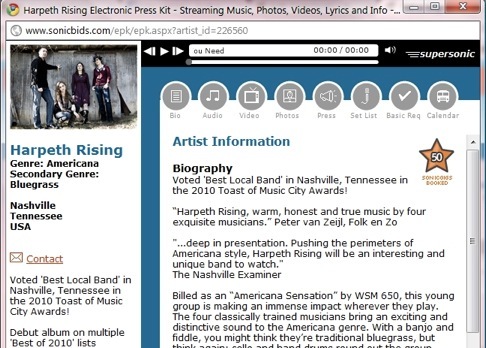 Keep the demos as a fun thing to share with fans on your blog, while your EPK highlights your highest quality work. Invest in a quality Main Photo. Picture an image of 4 flannel-wearing guys, one holding a fiddle, all with long beards standing in a grassy field. Now, picture an image of 3 girls, all dressed in purple with loads of pink lipstick and their hair taking up half of the frame. You can at least safely assume these two bands don’t make the same genre of music, even though you haven’t heard either of them play. What I’m trying to say here is that your image matters. I know that ideally your “music will speak for itself” …but I hate to say it… it doesn’t. The viewer of your EPK sees that before anything else and it sets an immediate expectation of who you are and what you’re about. You main photo is your first impression. So don’t skimp on investing in your promo photos and make sure it gives off the right image for your sound. Write a descriptive Elevator Pitch. If you were riding in an elevator with a stranger, and you had 30 seconds to sell your band to that person, what would you say? Choose your words carefully on your EPK elevator pitch, because this is your chance to grab the reader’s attention. The most important thing to remember is that the pitch should describe the music, because music is what the reader is looking for. The second thing to remember is that arrogance, triteness, and vagueness don’t work well. Avoid saying things like: “You’ve never heard anything like this before!” or “My music defies all genre and comparisons.” If you want to talk quality, highlighting a single great quote from a blogger or a recent award is a good tactic to get the point across. Display complete Calendar Dates. A complete and up-to-date Gig Calendar is one of the most important and useful things to have in your EPK. It’s pretty simple: your calendar is your line-item resume. Promoters, especially those for performance opportunities, want to know the types of venues you are playing, how often you are performing, and even what nights of the week you tend to play. A complete calendar that includes past performance dates gives viewers a great idea as to where you are in your career, and if you’re a good fit for their gig. Also, many promoters prefer to see bands live themselves before booking - without the where and when, no one will know where to go to see you play and they most likely won’t go to the extra effort to head to your Myspace to check it out. List out your Press Reviews. It’s nice to tell everyone how great you are, but it’s even better if you can show how great other people say you are. Keep in mind that brevity isn’t just the soul of wit – it’s the soul of everything in the music world. Choose the best quotes from the best articles and include those. And when I say “Press” I don’t mean only the New York Times. Posting links to bloggers that gave you a shout is definitely something to include. Sonicbids.com is a sponsor of the 16th Annual USA Songwriting Competition. If you want some more tips, check out the Sonicbids Lounge – our blog dedicated to educational content – or find me on Twitter @SonicbidsTess and we can keep the conversation going.